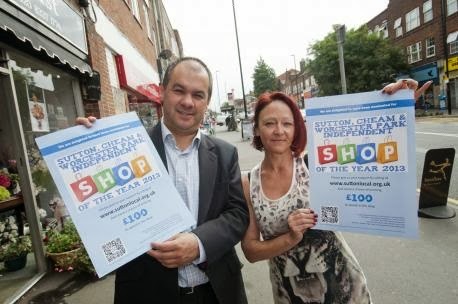 The Independent Shop of the Year competition is finishing tomorrow and apparently Worcester Park and Cheam are the two main areas that have really got behind their local independent shops. The competition, which was launched at the beginning of September by local Conservative parliamentary candidate, Paul Scully (pictured here with Gaynor from the Conservatory Florist - thanks to the Sutton Guardian for the photo) has attracted wide support but the most feedback has been coming from these two areas, which apparently both have shops in the running for the major prize. There is still time to get your vote in for a chance to win £100 to spend in the winning shop. To vote, just go to the website www.suttonlocal.org.uk.